You may have heard about, or even attended, our Festival Wedding Open Day last weekend. It was a fantastic day, and it was so nice to meet so many excited couples! We managed to showcase ways to create the ultimate festival wedding. For those who couldn’t attend, we thought we would share some great ways to incorporate the festival style into your big day. The fabulous thing about festivals are that there are so many different types. From the classy vintage style to the bold and playful carnival. You could even glam it up and adopt a more Coachella vibe into your big day. Once you have an idea of the style you want, you can build all your wedding stationery, décor and entertainment around it. Having a focused theme for your festival wedding creates such a glorious impact, forming a world of colour, music and excitement whichever way your guests turn. With the right decoration and accessories a festival wedding is possible indoors, however, this wedding theme really lends itself to an outdoor wedding. 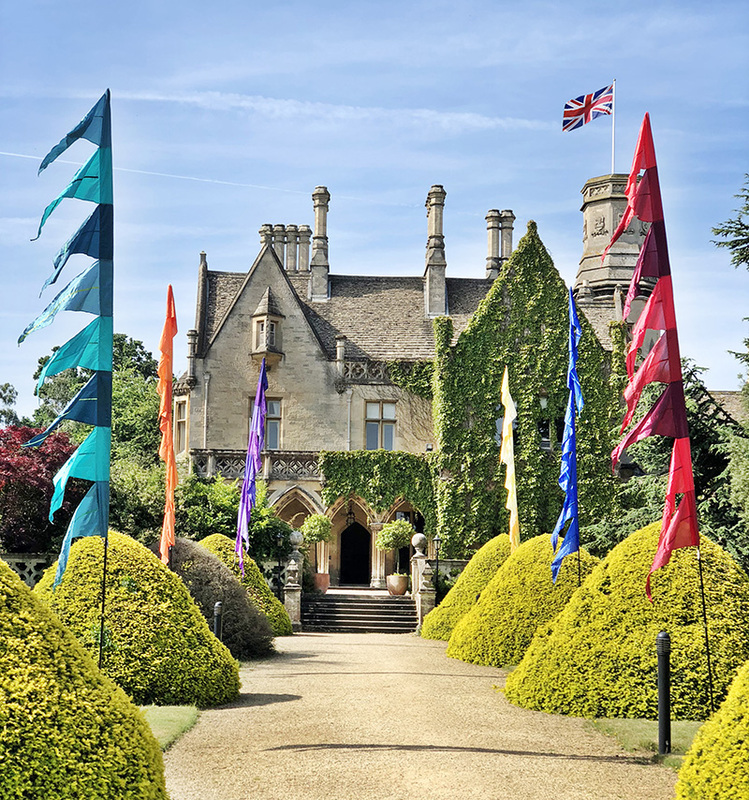 We have some stunning outdoor licensed areas, choose from the beautiful ornate arches of the Manor house or the elegant Victorian Pavilion by the lake. The important thing when creating a festival wedding is that should have lots of things going on. Whether it’s something as delicate as some colourful bunting in the trees or a more elaborate jamming session in the gardens. Why not offer outdoor games and delicious carts of food, have floating lanterns being let off on the lake or sparklers in the evening? 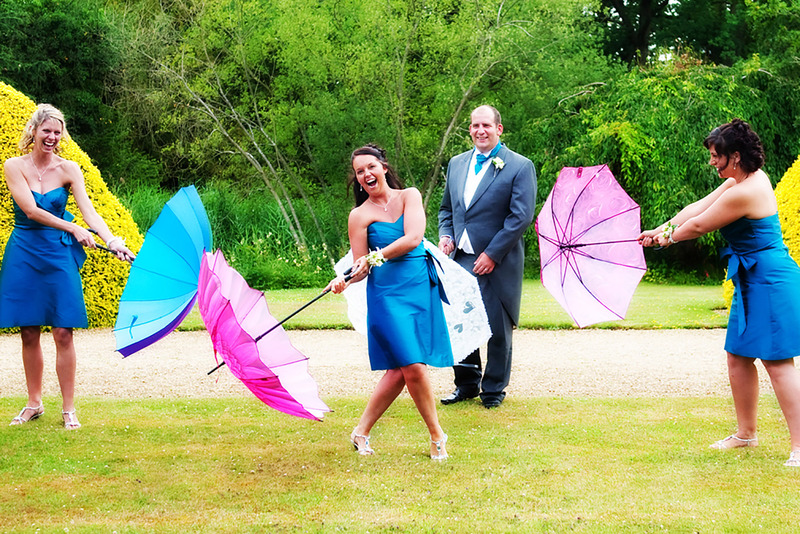 If your guests know what’s happening, your wedding day can be as chaotic as you like, because that is the festival way. When searching for a photographer, look for someone who enjoys taking candid shots. This theme isn’t made for the more serious wedding poses. Have a few posed family/close friend’s wedding photos to add to your collection, but the more natural your images are, the more ‘festival’ they will be. Create the perfect backdrop or frame for your silly or selfie photos. Flower rings, flower walls and vintage photo frames create the ultimate setting for your group pictures. Think artistically when it comes to your props. This is the perfect opportunity to get playful with flower crowns, wellies, wristbands, colourful umbrellas and even fairy wings. The rules are that there are no rules, if it’s fun and fabulous, your photos will be spectacular. For some, the food is the best part of a festival. Think canape style, handheld cuisine which can be enjoyed whilst up and about, dancing or mingling. 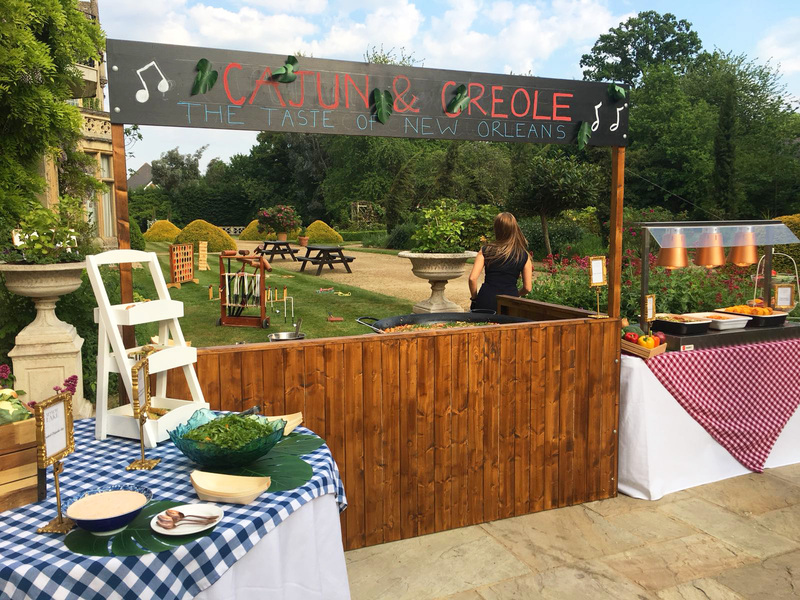 This kind of wedding is perfect for featuring a selection of carts, where your guests can create themselves a pimped-up prosecco, or dainty fish n chip cone. You could even offer a Taco cart! For the main event (food wise), you could enjoy a sharing banquet at your tables and then treat your guests to some dishes with a difference for the evening, including a New York Feast and Caribbean Grazing Station. The Festival Wedding menu can be so varied, dramatic, exciting and that little bit different! You can’t have a festival without an abundance of music. This can really represent you as a couple and show off your own musical tastes. The great thing about The Manor is that you can have music in many areas. The dream would be to have an acoustic set in The Rock Bar or a band in the gardens during drinks before your DJ in the ballroom to dance the night away. You could always decide on a live vocalist during your ceremony whilst you and your new hubby/wife sign the register. Other entertainment options can also be incorporated during a festival, from magicians or as we mentioned earlier, garden games. We have some great games available to hire at The Manor, which we can have set up ready for you and your party. 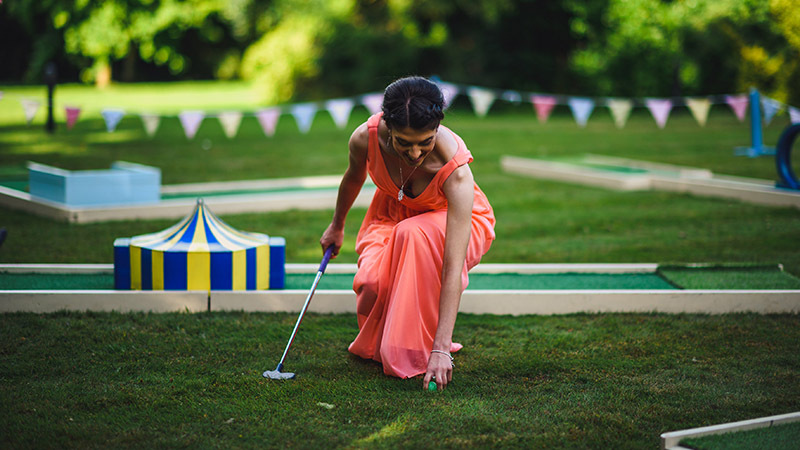 We have a fantastic crazy golf ready to set up, which is perfect for the big kids as well as the small. A broad selection of entertainment keeps the day flowing and the spirits up, creating a real buzz throughout your wedding day. Last but by no means least, we have the décor. From the wedding stationery to the table plans there are so many amazing ways to dress up your festival wedding. Who needs formal invites when you can have lanyards, tickets or personalised wristbands! 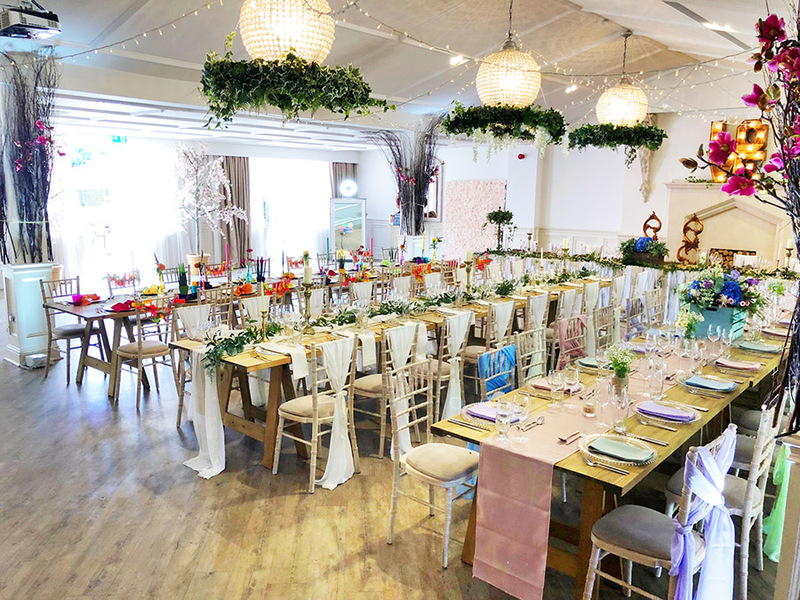 The set up for our more elegant weddings involve the giant round tables, however, for a festival wedding, we love to use the long table set up. These look great without a tablecloth and are perfect for guest’s interaction, even the shyest of your friends and family. Be as random as possible with your wedding décor. Think layer upon layer of wonderful weirdness that you would find at Glastonbury. We have recently added a selection of props that are ready to hire out. We now have flamingos, decorative frames, lanterns, Big Bertha bean bags and deck chairs, to name a few. If you are thinking about hosting a festival wedding, give our team a call on 01242 245 071 or email weddings@manorbythelake.co.uk and we can help you come up with some imaginative ways to make it happen.